A fraction is a mathematical term that represents dividing a whole into parts. It contains a numerator and a denominator. The numerator is the top number of the fraction and represents the number of parts; the denominator is the bottom number and represents the total number of parts. When two fractions are compared they are either equivalent or nonequivalent. Two fractions are equivalent if they have the same value. The numbers may be different, but the overall value is the same. For example, 1/2 and 2/4 are equivalent fractions because they both represent one-half of something. To determine if two fractions are equivalent, cross multiply. To cross multiply, you multiple the numerator of the first fraction by the denominator of the second. Then you multiply the denominator of the first fraction by the numerator of the second. If the two numbers are equal, the fractions are equivalent. In this example 1 X 4 = 4 and 2 X 2 = 4. The fractions are therefore equivalent. Nonequivalent fractions are not equal to each other. To determine if two fractions are nonequivalent, you must also cross multiply. For example, to determine if 1/3 and 2/5 are equivalent, you must multiply 1 times 5, which equals 5, and 3 times 2, which equals 6. These two fractions are nonequivalent because the answers are different. Teachers often illustrate fractions using pies or other circle shapes. To illustrate equivalent fractions, cut one pie in half, illustrating each piece as 1/2. 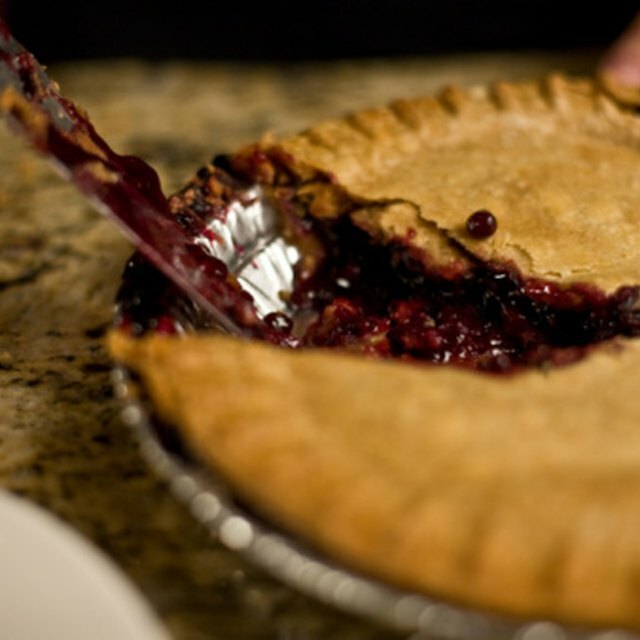 Cut the other pie into eight pieces and illustrate that four pieces of this pie is equal to one piece of the first pie. This example teaches that 1/2 and 4/8 are equivalent fractions. Pies or other shapes can also be divided in other ways to illustrate more examples of both equivalent and nonequivalent fractions. If you have a fraction and want to find other fractions that are equivalent to it, begin with the fraction, for example 1/2. To find equivalent fractions, multiply the numerator and denominator both by two, which results in 2/4. Multiply the original fraction by three to get 3/6 and multiply the original fraction by four to get 4/8. You can keep using higher numbers, for example: 5, 6, 7 and 8, to find more equivalent fractions. As long as you multiply both digits by the same number, the answers will result in equivalent fractions. George Mason University: What is a Fraction? VanBaren, Jennifer. "What Are Equivalent & Nonequivalent Fractions?" Sciencing, https://sciencing.com/equivalent-nonequivalent-fractions-8392022.html. 25 April 2017.